THIS TRIP IS CURRENTLY FULL – Please click below to place your name on a Wait List. INTEGRATED VACATION – HIGH ACTIVITY LEVEL! This vacation is in conjunction with a “general public” tour group. This trip is best suited for Travelers who are active and high functioning and who have strong social skills, are independent with self-cares, display positive behaviors and want to stay busy. Limited departure locations (see above). 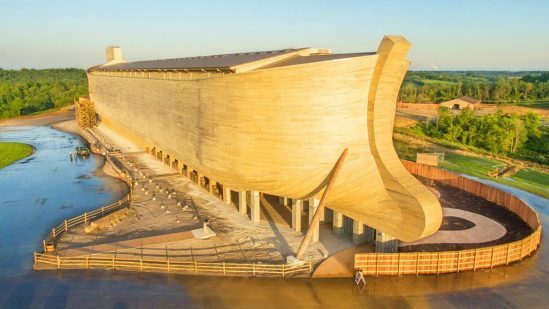 NEW TRIP – Lead by the husband and wife team of Reverend Richard and Joyce Johnson we’ll visit much more than the Ark Encounter and Creation Museum Biblical attractions. Richard, the long-time pastor at the LaValle Advent Christian Church, and Joyce will enrich this trip with their musical talents and deep faith. Day 1 – travel to Indianapolis where we’ll visit the beautiful Beef-n-Boards Dinner Theater for a performance of Disney’s “Little Mermaid”. Day 2 – spend the day exploring the Ark Encounter. Day 3 – spend the day at the Creation Museum. Day 4 – visit Amish Acres in Nappanee, IN (horse-drawn wagon tour, house & farm tour, “Genesis & Exodus” documentary film, Threshers Dinner and Round Barn Theater performance of “Freaky Friday” – a heartfelt, comedic and emotional musical. Day 5 – Nappanee step-on guided tour and return home. This trip includes deluxe motor coach transportation, seven meals and all attraction admissions. Significant walking.